In 2003 or so, I was NP, well, weakly ENFP. 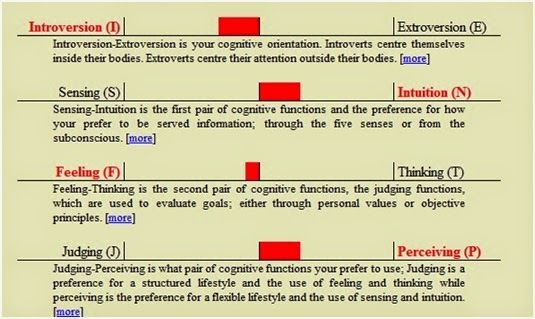 Was curious, so I took several free MBTI-like tests online just now. 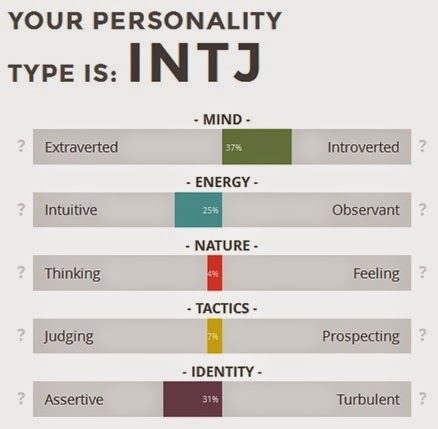 Looks like I'm still an NP, perhaps an INTP; my type was INTP in 3 of 6 tests. The other 3 had one mutation each: I to E, T to a weak F, and P to a weak J. The ENTP was actually an ExTP, being 50/50 on the N-S scale. Monday October 13, 2014, around 5pm. INTP: You're motivated by a need to understand the world around you and you value knowledge. You're a problem solver with an analytical mind, and you probably score very highly on intelligence tests. You have a gift for recognizing inconsistencies in others' logic and reasoning, and you value precise language. You're curious, insightful, and a nonconformist. Others might describe you as aloof at times. Analytical, knowledgeable, and intellectual, you prefer to immerse yourself in complex problems and projects. If the interest is there, you can become so engulfed in the problem and your own thoughts about it that you tend to forget about everyday living and become absent-minded and remote. You are driven by a desire to understand and explore the problems that interest you on an intellectual level, which means that sometimes you are more interested in the ideas that govern a given problem than in the actual problem itself. You want to go your own ways and you resent being controlled or told what to do. And to your credit, you do not want to control other people either, if only you can be left free to organize the ideas in your own head. According to Myers-Briggs, INFPs focus much of their energy on an inner world dominated by intense feeling and deeply held ethics. They seek an external life that is in keeping with these values. Loyal to the people and causes important to them, INFPs can quickly spot opportunities to implement their ideals. They are curious to understand those around them, and so are accepting and flexible except when their values are threatened. According to Keirsey, based on observations of behavior, notable INFPs may include Princess Diana, George Orwell, Aldous Huxley, Audrey Hepburn, Richard Gere, Albert Schweitzer and Isabel Myers. The polite, reserved exterior of INFPs can at first make them difficult to get to know. They enjoy conversation, however, taking particular delight in the unusual. When INFPs are in a sociable mood, their humor and charm shine through. Disposed to like people and to avoid conflict, INFPs tend to make pleasant company. Devoted to those in their inner circle, INFPs guard the emotional well-being of others, consoling those in distress. Guided by their desire for harmony, INFPs prefer to be flexible unless their ethics are violated. Then, they become passionate advocates for their beliefs. They are often able to sway the opinions of others through tact, diplomacy, and an ability to see varying sides of an issue. INFPs develop these insights through reflection, and they require substantial time alone to ponder and process new information. While they can be quite patient with complex material, they are generally bored by routine. Though not always organized, INFPs are meticulous about things they value. Perfectionists, they may have trouble completing a task because it cannot meet their high standards. They may even go back to a completed project after the deadline so they can improve it. INFPs are creative types and often have a gift for language. As introverts, they may prefer to express themselves through writing. Their dominant Feeling drives their desire to communicate, while their auxiliary intuition supplies the imagination. Having a talent for symbolism, they enjoy metaphors and similes. They continually seek new ideas and adapt well to change. They prefer working in an environment that values these gifts and allows them to make a positive difference in the world, according to their personal beliefs. - P sort of means less money. No surprises there. J's are more aggressive maybe, they care more about real life, real rules, real status, and real symbols, so they likely earn more, work in more high-stress situations on average than Ps. "Generally, INTPs build successful careers in areas requiring quite intensive intellectual efforts and calling for creative approach. INTPs are often found in research, development and analytical departments. INTPs often make a very successful career in academia thanks to their strong and versatile way of thinking and originality." Interesting. They think I love systems. INTPs are pensive, analytical folks. They may venture so deeply into thought as to seem detached, and often actually are oblivious to the world around them. Precise about their descriptions, INTPs will often correct others (or be sorely tempted to) if the shade of meaning is a bit off. While annoying to the less concise, this fine discrimination ability gives INTPs so inclined a natural advantage as, for example, grammarians and linguists. INTPs are relatively easy-going and amenable to almost anything until their principles are violated, about which they may become outspoken and inflexible. They prefer to return, however, to a reserved albeit benign ambiance, not wishing to make spectacles of themselves. Mathematics is a system where many INTPs love to play, similarly languages, computer systems--potentially any complex system. INTPs thrive on systems. Understanding, exploring, mastering, and manipulating systems can overtake the INTP's conscious thought. This fascination for logical wholes and their inner workings is often expressed in a detachment from the environment, a concentration where time is forgotten and extraneous stimuli are held at bay. Accomplishing a task or goal with this knowledge is secondary. INTPs and Logic -- One of the tipoffs that a person is an INTP is his or her obsession with logical correctness. Errors are not often due to poor logic -- apparent faux pas in reasoning are usually a result of overlooking details or of incorrect context. Games NTs seem to especially enjoy include Risk, Bridge, Stratego, Chess, Go, and word games of all sorts. (I have an ENTP friend that loves Boggle and its variations. We've been known to sit in public places and pick a word off a menu or mayonnaise jar to see who can make the most words from its letters on a napkin in two minutes.) The INTP mailing list has enjoyed a round of Metaphore, virtual volleyball, and a few 'finish the series' brain teasers. which of us would have to take the responsibility for organization and maintenance of the aforesaid group/club/whatever. Today INFP but really a very very marginal F signal, so it was really IN(T/F)P. The strongest signals were the I and N.
Still an NP (xNxP) but defintitely feel like an F. And an I. Been living in my cave, mostly "unemployed", lost some shades of skincolour even, since February 2016. So, more strongly Introverted than before. More introverted too when I have less money looool. To continue that thought, instead of my engineering teaching job which involves a lot of mathematical ideas of course, I've written more poetry, about a month ago I published one with two to go mostly from poems written in the past year or two. So I lost some T-bias and gained some F-bias and I think I'm truly both strongly T (Thinking) and strongly F (Feeling) and that as my psychologists aimed to help me do in the early noughties (circa 2003) my thinking and feeling are quite united today. It's hard to imagine myself truly being an E (Extraverted) but it's possible that I'll do that sometime. Today there is less of a reason for me to be E than ever - I want to learn and learning is scant in Nigeria on the streets but rich on the internet. So I choose internet. Come to think of it, America is very dumb too. Nigeria vs. America in a match of gullibility? Today INFP but easily switched to INTP; summary: still as NP as ever. To find the poetry collections, click on Books so yes, poetry collection #7 (lucky 7 ?) was published last month and #8 and #9 are 90% complete - completely written, completely typed, partially assembled, with proofreading, cover design, page/letter design etc. to go. And now for an astrological note... I believe I'm an Aquarius ascendant and a Pisces moon. Hmm. Aquarius very 'thinking' and off-beat anti-establishment, while Pisces very 'feeling' and oblivious of if not anti- establishment. By the way, Rihanna is a Pisces near the cusp of Aquarius and Pisces. Other than these colours, however, I'm Taurus in almost every major way - My main (Sun) sign is Taurus but also Merc, Ven, Mars signs. My outer signs are half (Jupiter, Saturn, and, well, Pluto?) in Libra which is in a small way Taurus-like (ruled by Venus, of love, aesthetics, smooth-natural-earthy beauty) but in a small way Aquarius-like (air sign and knowledge, abstraction, and information) and that's almost the entirety of my chart: A solid bed of Taurus with Pisces Moon + air-Aqua mind. I have a special page for my astrological observations, and I do realize that Myers-Briggs and astrology don't seem to mix, but to me they do, just like the T and the F.
Re: in my first comment above, "but I failed at natural science" hahaha how do I define failure? Getting 98% instead of a full 100% is what I've termed failure here looooooooool. Oh wow, to have some perspective.